STEM education is critical to creating the next generation of innovators and entrepreneurs, said Ed Swallow of The Aerospace Corp., but there’s a catch. Language skills are foundational to all kinds of learning, and mathematics skills are similarly vital to advancing in science and engineering. Yet, numerous studies and stacks of test scores show U.S. students lag behind in math and science literacy. “Without that literacy, who will develop the next ‘killer application’ or the must-have personal productivity device of the future?” Swallow said. The Aerospace Corp. is a major sponsor of the 2018 K-12 STEM Symposium facilitated by WashingtonExec on April 14. The symposium began as a way to bridge gaps in the workforce pipeline by bringing together students, parents, educators and leaders in government, business and nonprofit work. This year’s event at Nysmith School for the Gifted is expected to draw nearly 5,000 attendees for a day filled with speakers, presentations and hands-on demonstrations of STEM skills at work. The goal is to shape tomorrow’s workforce by connecting students with the inspiration and guidance they need today. At The Aerospace Corp., data scientists, cybersecurity experts, digital circuit designers and similar specialists are all in high demand, but companies struggle to fill those positions. That also goes for positions that require advanced degrees, U.S. citizenship — for purposes of getting security clearances — and high levels of competencies in math and science. Meanwhile, U.S. graduate schools have the lowest percentage of U.S. citizens in history. Not only does a limited workforce mean jobs are sometimes hard to fill, but it can also mean a lack of diversity. For Swallow, the idea of “diversity” is about more than just being politically correct. Yet, studies show that by fifth grade, students already begin to drop out of the STEM pipeline. This year’s symposium theme, “Building Tomorrow’s Superheroes, Today,” piggybacks on recent box offices successes. “The technology on display in movies like ‘Black Panther’ are fantastic ways to spark creativity and innovation, as long as audience members realize that at some point someone has to create those, understand why they work and how to make them work, engineer their capabilities, finance their production, etc.,” Swallow said. Then, there are devices of the big screen that eventually come to life. WashingtonExec recently talked with Swallow about ways to support students in developing STEM skills. WashingtonExec: Please talk about your experience as a student and young person. Did you have to overcome any social stigmas around taking more challenging classes? Did you ever struggle with grasping the material? What inspired you to enter the career field you chose? Swallow: I never faced a social stigma around being in advanced classes, but I knew many people who did. In fifth grade, I had a fantastic science teacher, Mr. Russo. He made science fun and related science and what I now know as engineering to the real world and helped me visualize why things work. We had three fifth-grade classes, and we split up into three science classes. The top students all went to Mr. Russo, and the next level went to the next teacher and so on. By the middle of the year, I could see that I was having more fun, learning more by doing, and absorbing more material than the other students in my homeroom class. How many more engineers and scientists could have been inspired if they had all had Mr. Russo as their teacher? One thing I realized later in life, as I was student teaching, was that those same fifth-grade classes were split the same way for math — and that the vast majority of the people in my group were white and male, and the vast majority in the “lowest” group were people of color. It jolted me into better understanding the challenges people of color face, which has guided my thought processes as I advocate for STEM education, with a focus on underrepresented populations. 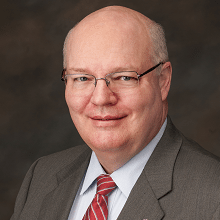 WashingtonExec: Do you have children and/or grandchildren? What advice or guidance do/did you give regarding education and career preparation? What advice would you give to students and parents today? Swallow: I do not have children myself, but plenty of nieces and nephews that I do not hesitate to give advice to (much to their chagrin). I fully support their education goals, whether that is STEM or not, but help them understand that making a living in today’s tech-driven economy requires a much more tech-savvy, math literate and scientifically curious citizen than ever before. Keeping up with the rapid change of technology and the ability to think critically are both skills that STEM teaches, and we will always be better off as a country the more we have developed those skills. WashingtonExec: What are you most looking forward to in this year’s STEM Symposium? Hands-on activities, which translate into project-based learning in school, are the most powerful way for students to not only learn the basics, but to retain it for the rest of their lives. That is how I got started, in Mr. Russo’s class, doing projects that excited me. I get that same feeling every year at the STEM Symposium. I get to be a fifth-grader again — and isn’t that something we all want every once in a while? 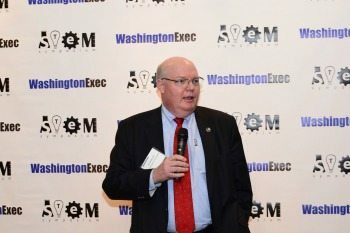 WashingtonExec: Is there anything else you would like to add? Swallow: The STEM movement is led by a driven group of people who realized that science education took a back seat to other disciplines for way too long, and that has hurt a generation of students that are now in the workforce. We need people in the pipeline who can be the creators of the next personal productivity device, the next entertainment medium, the next whatever. As a country, we cannot cede that leadership to other countries unless we wish to have our standard of living reduced, just like our international math and science test scores have done. The two inevitably go hand in hand. This is a matter of national security, economic security and personal advancement. What else could be more important?